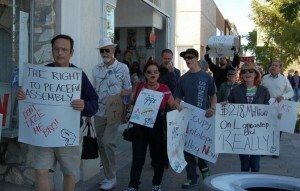 Occupy AV previously held a march on Oct. 29th. The group will hold a second march on Saturday. LANCASTER – Plans are moving ahead as scheduled for the “Move Your Money” march and rally on Saturday, November 5th, according to Occupy AV facilitators. This is the second demonstration for Occupy AV; the group held its first demonstration on October 29th. Read the story here. On Saturday, demonstrators will again meet at 10 a.m. at Lancaster City Hall and follow the same route as the first march – Lancaster Blvd. to 10th St. W and then back down Lancaster Boulevard to Sierra Highway. Facilitators say because this is a “Move Your Money” march, the group will hold longer demonstrations in front of each of the big banks on The Blvd, including Chase, Union Bank, Wells Fargo and Bank of America. They will be asking customers of these banks to close their accounts and move their money to local, not-for-profit credit unions. Occupy AV will be providing material on how to do this. It’s a small but powerful act that tells the big banks that we will no longer stand for their corruption and for their destruction of our communities and our livelihoods. They have profited from their malfeasance for too long, costing millions their chance at the American Dream because of their reckless speculation and gambling; compromising the futures of countless people who were essentially forced to invest their retirement savings in the banks’ junk securities. Moving to a credit union is a relatively simple thing for most anybody to do and the fact that credit unions are owned and controlled by their members means that people who make this switch can have greater say over how capital is re-invested in their communities. The occupation will begin immediately following the march, near the gazebo in American Heroes Park (Elm and Kettering). Initially, Occupy AV plans to have a presence in the park daily during the park’s hours of 6 a.m. and 10 p.m. Each night there will be a General Assembly at 7 p.m., open to everyone, which will determine when and if Occupy AV will attempt to hold the space beyond those hours. Those wishing to join the occupation should come prepared to learn, discuss, and assist in creating a better future, say Occupy AV facilitators. They should also come prepared to stay for the night, if necessary. This means bringing water, food, tents, signs, umbrellas, awnings, tarps, instruments, passion and optimism. The occupation will continue, indefinitely, in solidarity with the other occupations all over the world. Each day will bring a different schedule, to include workshops, marches, and other visibility actions. There will be a welcome tent/table set up where people can inquire about the day’s schedule. For more information on this movement, visit the group’s facebook page. 1 comment for "Occupy AV to hold a “Move Your Money” March & Rally Saturday"
I was a Security Pacific Bank customer in the 80s till BofA took over and hated the idea. But, I liked the convenience of many locations and ATMs but never took out a loan or charged on my BofA Mastercard all these years. I’m ready to move as soon as I can do it conveniently for myself.